To create this little owl we need to do several things. First is to make a mold of the stamping with a silicone mold compound. 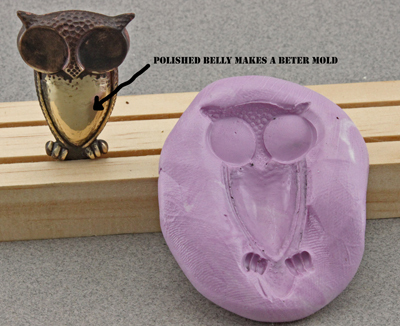 I use Alumilite Mold Putty which is a two part compound that is mixed in a 1:1 ratio very quickly folding the soft putty until it is uniform in color. This must take place with-in one and a half minutes. 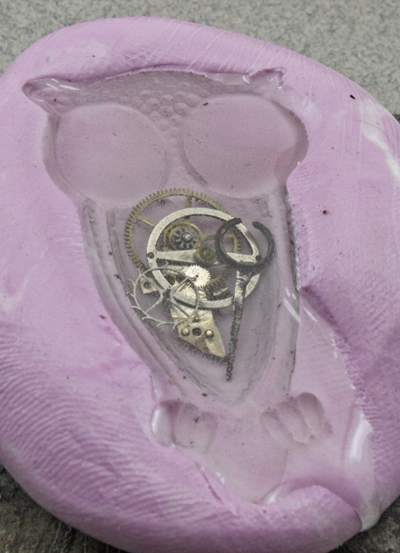 It is then molded over the stamping and allowed to set for 20 minutes. 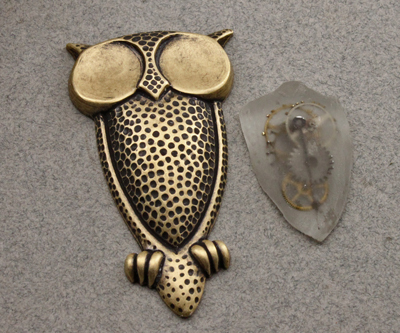 The brass is then removed and Ice Resin mixed and poured to fill the mold. At this time you can fill the breast portion of the owl with whatever parts you like. I used gears and watch hands. After this sets up overnight it is ready to remove from the mold. 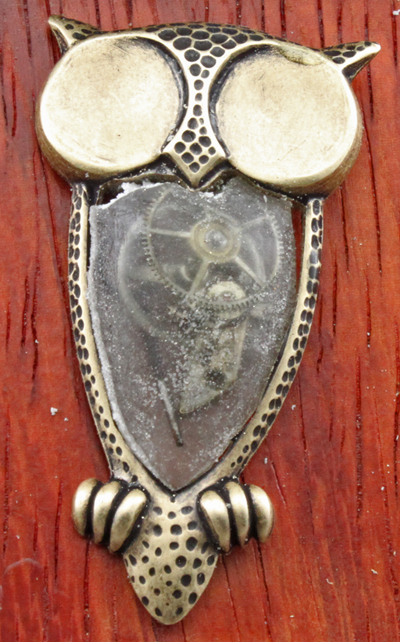 As you can see it front has reproduced the texture of the brass and it obscures the detail of the watch parts. This next picture shows the back of the cast and it is clear. 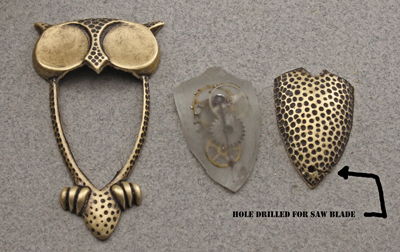 The next step is to use the jewelers saw to cut out the shape of the breast from the Ice Resin cast. This material cuts easily and you could even use sharp scissors. You can see that the surface has a dull look. This is because I had to sand away the texture from the mold. To correct this on the next owl I prepared another casting differently. First I annealed the metal then pounded out some of the texture from the inside with a dapping punch and then filed and polished the breast area. 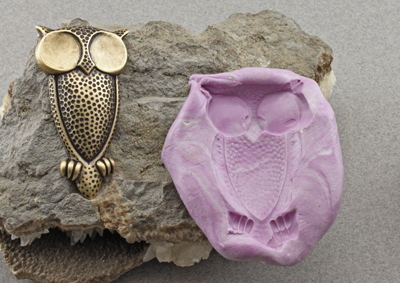 This time a new mold was prepared and another cast made for a second owl. 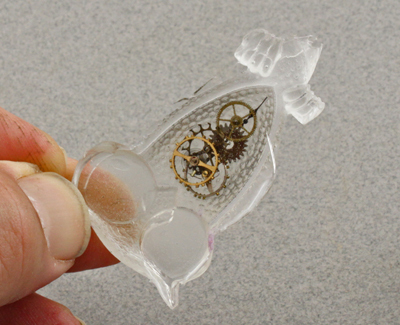 Because the surface was polished on the original the molded piece came out more transparent. Due to the wonderful characteristics of Ice Resin you can heal an imperfect surface. First we have to cut out the breast area from the metal. To do this, drill a hole in the waste area and insert the saw blade through the opening. Cutting with a jewelers saw is easy if you follow a few rules. Support the metal on a bench pin or other solid surface so that the only thing moving is the saw blade. If you try to freehand it you will break blades and be frustrated. Another rule is to let the up and down action of the saw be what cuts the metal…don't push against the blade and finally when the blade binds back up and start again. In corners continue sawing up and down in place while turning the blade slowly toward the direction you want it to go. This is the correct way to saw with the work flat over the opening in the pin and the saw vertical. With the insert cut to shape and the breast plate removed we are ready to fit the insert through from behind. If it needs filing or trimming do so now. But don't worry if the fit isn't exact because we will fill the spaces with Ice Resin. You can see that the second owl has some rough areas around the edge. For the best clarity these should be sanded with an emery stick. Now we can pour the last bit of resin to fill in the edges of the breast and to shine up the surface. 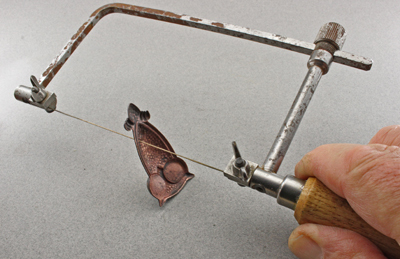 The stamping has been mounted to clear tape and burnished down. Then resin is poured over the breast portion and carefully dripped into any mismatched edges. 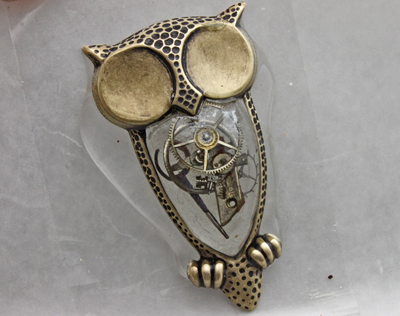 The second time I made this owl I filled the back of the stamping with resin before I cut out the metal section. This makes a better seal around the breast section. 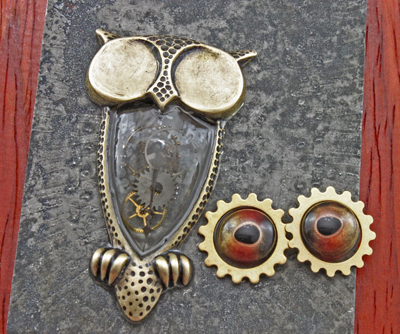 I chose eyes from a taxidermist for this piece…you could use any 10mm cabochon to use. They were glued in place with E-6000 and the sprocket rings from B'sue were glued around them. 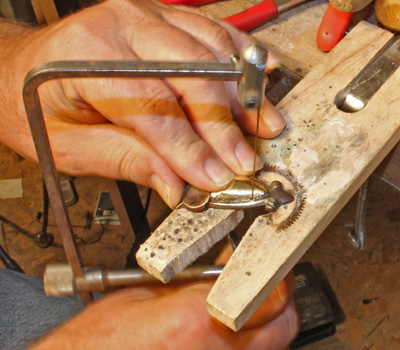 To finish off the piece you could glue on a pin back or as I did glue on another gear ring for a bail. 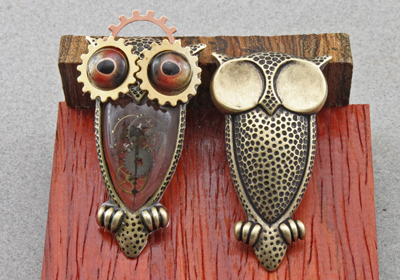 Because not everyone likes steampunk…you can easily add other elements to the mix. 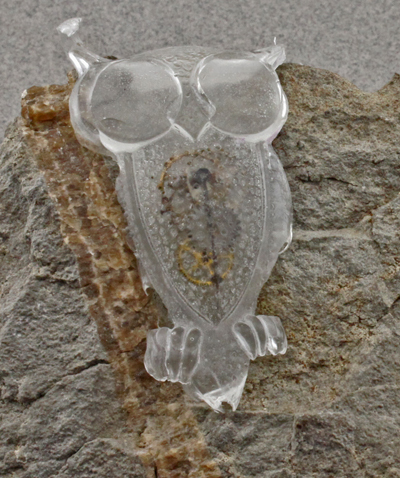 My next owl will have the breast paved in stones set in Ice Resin.